Fahd Syed, an advocate and Yemeni-American ally to U.S. Sen. Chris Murphy, shows a picture of a relative killed in the Yemeni Civil War. It was part of a plea for Americans at-large to push their legislators to withdraw military support to Saudi Arabia. "Saudi Arabia could not continue," says U.S. Sen. Chris Murphy it's support of Houthi Rebels in the Yemeni Civil War without materials and logistical support it gets from the U.S.
Fatimah Aulaqi, a Yemeni-American from Waterbury, has raised over $600,000 for Yemeni civilians. But her and the organization she works with, Yemen Aid, would like to raise at least $1 million. 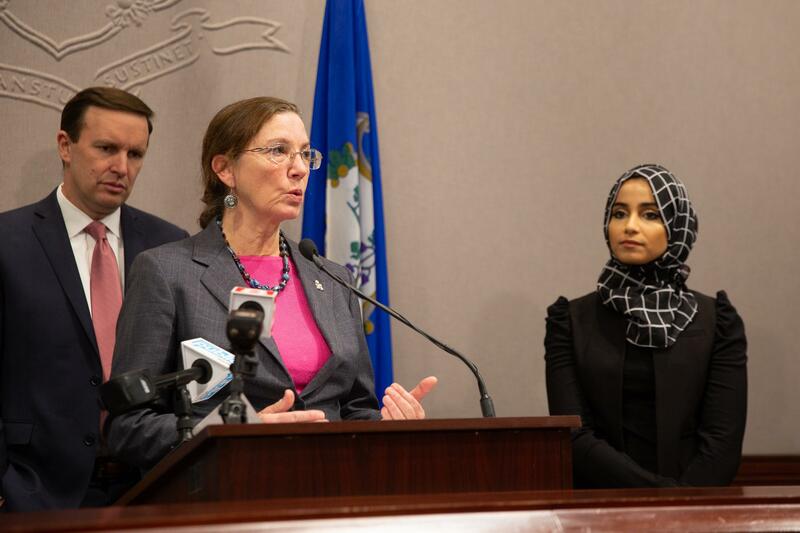 Yemeni-Americans living in Connecticut are asking people to put pressure on their elected representatives over U.S. involvement in Yemen’s ongoing civil war. The group was invited by Democratic U.S. Senator Chris Murphy to the Legislative Office Building in Hartford Friday to address Saudi aggression in the area that they say is made possible by American support. Fahd Syed of New Haven has family in Yemen. He said that one of his relatives was murdered as a result of Saudi Arabia’s involvement in the war. Two sides in the war – Houthis and Saudi-backed forces – are fighting each other in the area with devastating consequences for Yemeni civilians. Syed supports a bill proposed by Murphy that would effectively end U.S. support that Murphy says makes Saudi Arabia’s presence in the war possible. “Saudi Arabia could not continue without the bombs, without the refueling support, without the targeting support and without the ability to say to the international community, ‘We’re not doing this alone, we’re doing it with the Americans,’” Murphy said. The Senate bill had support this week from 14 Republicans. It will be debated next week and if the measure passes, would move on to the House of Representatives. Dr. Anne Peterson of Americares said at a new conference in Hartford that a cease-fire in Yemen would allow for organizations like hers to administer further aid to civilians there. The war in Yemen is already being recognized by the United Nations as the world’s worst humanitarian crisis. It’s being spurred by an unprecedented cholera outbreak. Dr. Anne Peterson, Americares’ senior vice president of global programs, said that the epidemic is exacerbated by an inability to provide health services to the war-torn country of Yemen. Her organization has been able to provide relief to Yemen but is hampered in its efforts to do more by the ongoing civil war. Peterson said cholera is easily treated. Patients need to receive fluids in an effort to avoid dehydration. Fatimah Aulaqi, a Yemeni-American from Waterbury, works for Yemen Aid. That’s an organization that Americares partners with to deliver medical and health supplies to the region. Aulaqi said that a Facebook campaign she started has raised over $600,000 for the Yemeni relief effort. But she said at the Murphy news conference in Hartford that more needs to be done. “The average Yemeni has paid the price of internal grievances while also facing the same price due to the failure by the international community which chooses to look away from all sides of the crisis including the root crisis of the civil war,” Aulaqi said. With the help of Americares, Aulaqi said that Yemen Aid has provided over 400 tons in medical supplies to Yemen. Correction: A previous version of this story referenced “Saudi-backed rebel fighters called Houthis.” The Houthis are actually fighting on the opposite side to Saudi-backed forces in the area. Murphy: Saudi-American Alliance A "Stain On America"
Connecticut Democratic Senator Chris Murphy said he’s probably been Saudi Arabia’s “loudest critic” in the U.S. Senate for the past five years. That’s because he believes that its government, led by Crown Prince Mohammad bin Salman, exports a “very intolerant version of Islam” that supports the building blocks of terrorist groups like Al Qaeda and ISIS. There's growing evidence that Saudi Arabia's crown prince was involved in the killing of Washington Post writer Jamal Khashoggi.